QE2 – an unmitigated disaster? This post is a guest contribution by Dian Chu, market analyst, trader and author of the EconForecast blog. There was a debate recently between Rick Santelli of CNBC and James Bullard, President of the Federal Reserve Bank of St. Louis regarding the inflation effects of the QE2 initiative. Bullard, the economist, cited the core inflation rate, and even the headline inflation rate as illustrative of a lack of serious inflation pressures in the US economy. 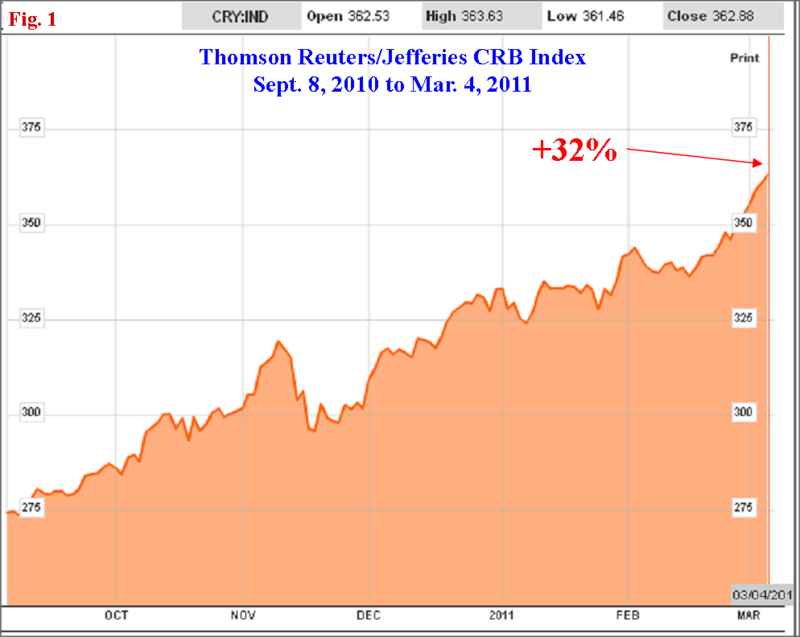 Santelli, on the other hand, talked the trader`s perspective of inflation wanting to use the CRB Index (Fig. 1) as a true indication of inflation effects since QE2 was brought up at Bernanke’s Jackson Hole Speech in August 2010. So let us compare two scenarios and ask ourselves would the US economy be doing better without the QE2 initiative? This just gives a snapshot of some of the inflationary effects for the US consumer. I cannot think of any argument where higher interest rates resulted from QE2 are good for the housing sector, which is the most troubled part the US economy. Nevertheless, I must add that the unemployment rate is better, and we have created more jobs since QE2 but with a highly fluctuating job pool where workers give up looking and leave the labor market it is hard to gauge the real unemployment numbers. Plus how much of the job creation is due to other factors like more business friendly policies from the Obama administration, a Republican Landslide in the Midterm Election, and the extension of the Bush Tax Cuts and a reduction in the payroll taxes for businesses? The S&P 500 is 230 points higher which can be argued is good for the “wealth effect” but stocks usually have a year-end rally so some of these gains probably would have occurred even without QE2. There are some substantial price increases in a lot of these inflationary metrics for both businesses and the US consumer, not to mention the reduced purchasing power of a much lower US dollar (Fig. 2). More importantly, inflation data utilized by the core and headline rates are behind the curve of futures prices by anywhere from 3-6 months so the true inflation pass through effects of these higher input prices at the futures level have yet to be realized in the Fed`s measures of inflation data. For example, gasoline prices at the pump probably lag the futures prices established by the RBOB contract by 20-30 cents. Likewise, the full effects of higher cotton prices will take much longer to work their way through the supply chain to consumers at the retail level for clothes they purchase. It may take another six months for the damage that has already occurred at the futures level to be fully experienced by consumers of cotton products, which would lead to an underestimate of the current inflationary effects in the economy. It should be noted that parts of the economic data are deflationary in nature like housing and wages, which serve to artificially keep the inflation numbers utilized by the fed down, which is the biflation phenomenon I previously discussed. And if you add in the 6 month lag factor for inflation effects to pass through to the data, a completely different inflation story starts to emerge. However, this still misses the important barometer for analyzing QE2 which should be the following question: “Which scenario is better off for the US economy?” and not any argument of what the current inflation level is in the economy. This assumes that some inflation is better than no inflation, and I would argue that being able to finance a home mortgage at 100 bps lower, and a dollar per gallon cheaper gasoline is better for businesses and consumers, and that this scenario is far better for fostering sustainable economic growth than the current scenario of QE2 and its effects. Really Better Off with QE 2? So the question for Bullard misses the mark if one argues with him what the current or even future inflation effects are for the economy due to QE2. The real question for Bullard is would the US economy be performing that much better without QE2? If you add up all the pros and cons of QE2, guess which scenario would 9 out of 10 independent economists pick for an environment that fosters economic growth? It seems regardless of what the inflation data says is the overall inflation rate in the economy, QE2 gave us all the negative, anti-growth, lowered standard of living type of inflationary effects that act as a major tax and headwind for both businesses and consumers going forward, and very little of the much needed “Record GDP Growth” and “Eye-Popping Job Creation” bang for our costly buck. It seems we pretty much could have gotten this same level of current GDP growth and job creation without massively devaluing the dollar in the process. Sometimes a little patience goes a long way, and if the fed would have waited until the November elections where both the business climate and economic data were improving all on their own we could have had the best of both worlds with a low inflationary price stable environment, and a slow but steadily improving employment situation. The real fear and irony is that once the full effects of QE2 are realized in the US economy, that we start reacting to said inflationary effects both through tightening monetary policy and consumer/business behavioral changes, and the US starts giving back some of its recent economic gains, and becomes vulnerable to the very scenario that the Fed was trying to avert in the first place, a double dip, deflationary downturn in the economy. Source: Dian Chu, EconForecast, March 6, 2011. 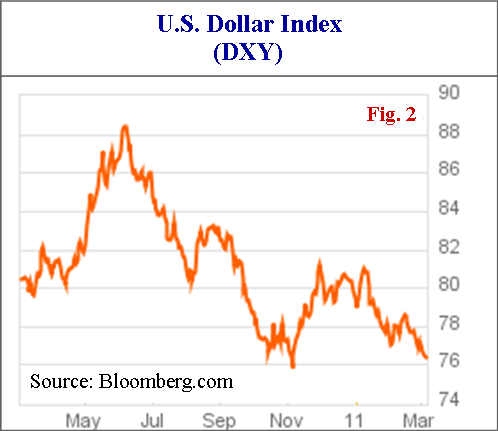 1 comment to QE2 – an unmitigated disaster?